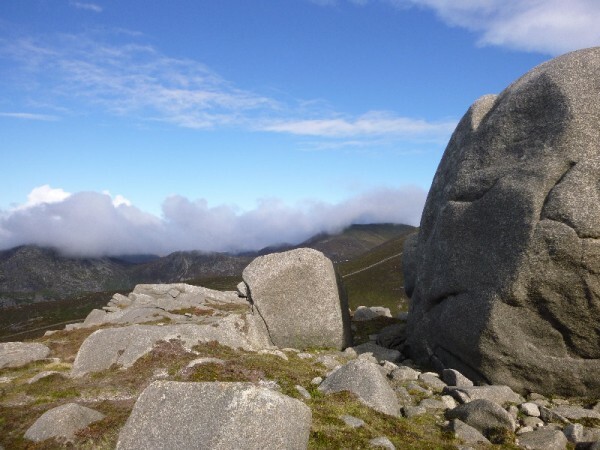 Situated on the eastern side of the Mourne Mountains, Chimney Rock is easily accessible by track. You can park your car at Bloody Bridge car park and walk for 30 minutes following the path all the way up. 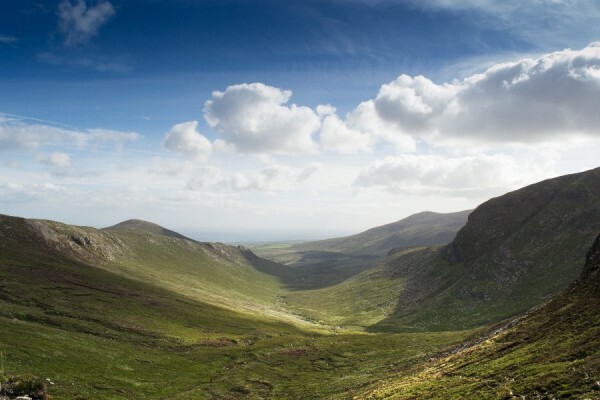 Alternatively if you’re feeling really adventurous you can first climb Slieve Donard via the Glen River track and then descend along the wall until you meet Chimney Rock. This mountain in particular is windy all year round, which is why the milder temperatures of summer months make this a great spot to bag your first summit camp. 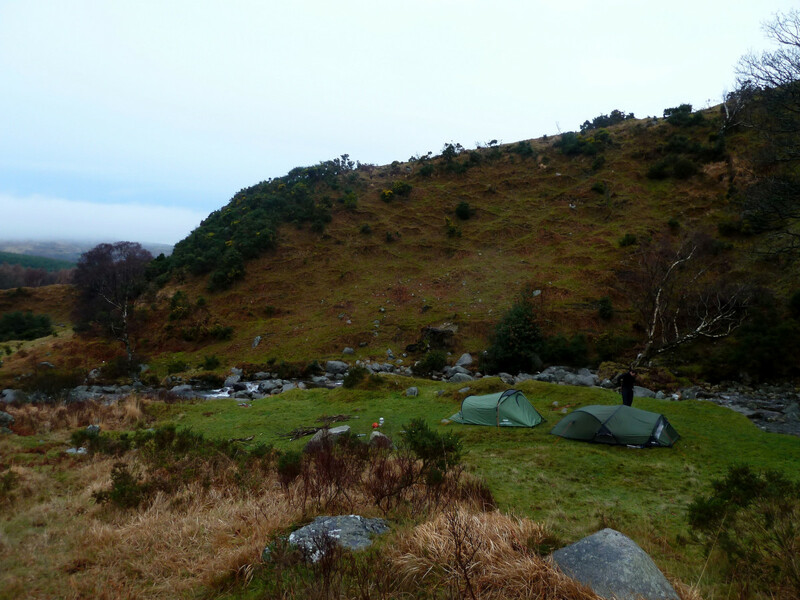 The area at the top is especially exposed, so pick a mild night and pitch your tent behind some of the large boulders for shelter. This spot would rank higher in our list if it wasn’t for the lack of flat space to sleep. There are numerous rocks and boulders on this summit, so leave plenty of time to find a suitable place to pitch when arriving. A picturesque hill overlooking Spelga Dam and surrounding countryside, Pigeon Rock is a small and easily accessible spot that makes for a great overnight camp. It can be a little wet and boggy in places so make sure to leave enough time to find a dry campsite before it gets dark. Camping closer to the reservoir will provide you with easier access to water, but also more chance of noise from the bordering road. A carpark is situated at the bottom of Pidgeon Rock as well as another on the adjacent side of the reservoir. 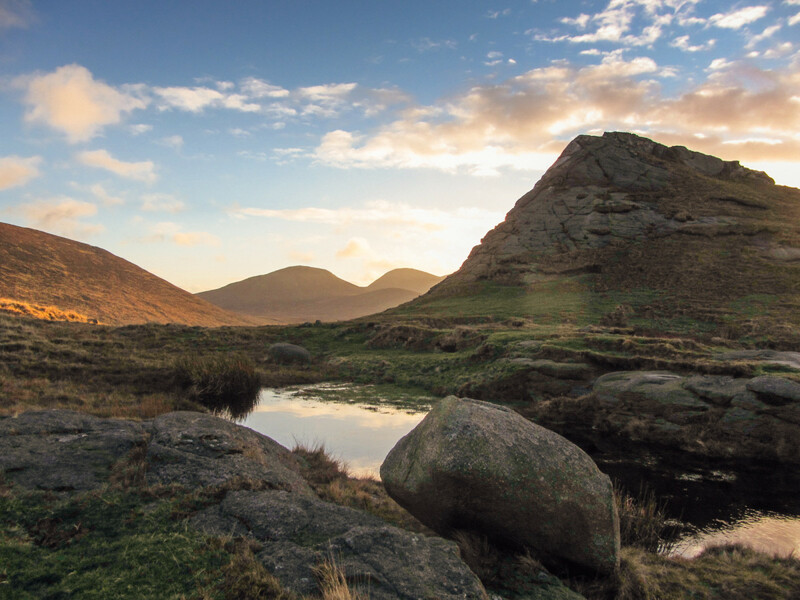 Small, easy accessible and full of character; Hen Mountain stands on the gentler, more barren Western side of the Mournes. This little mountain provides great views and a number of rocky torrs that can be explored and climbed to get the best views of the surrounding mountains. Campers can use the nearby car park on the Sandbank Road and then walk along the gravel path until they arrive at the foot of the hill, from there it is only a 15-20 minute climb to the top. A perfect lowland area with many suitable camping spots, Annalong Valley has sweeping views and a flowing river for water. Parking at the Carricklittle car par, follow the Carricklittle track for a couple of kilometers until you reach the end of the forest on your right. From here you can continue along the track upwards into the valley or pick a spot of your liking closer to the Annalong Wood. With no uphill walking this is a great option for those with a lower level of fitness. Beware though, in some of the more sheltered areas the chance of midge is rather high; so remember to bring that bug spray! Just outside Tollymore Forest and close to the boundary wall that encloses it, runs Spinkwee River. Sheltered by the surrounding trees and hillside, this campsite sits beside the river and overhanging trees that can provide shade from the summer sun. With space for around seven to eight tents and a running source of water this campsite is very near perfect for first time wild campers. While it is close to public forest paths, it is hidden from sight enough to make it feel that little bit wild. Heads up! Due to the popularity and ease of access to some of these campsites, litter can sometimes be present. Don’t let that put you off though: bring an extra rubbish bag and make sure to leave these beautiful places the way you would like to find them. What do you think of our recommendations? 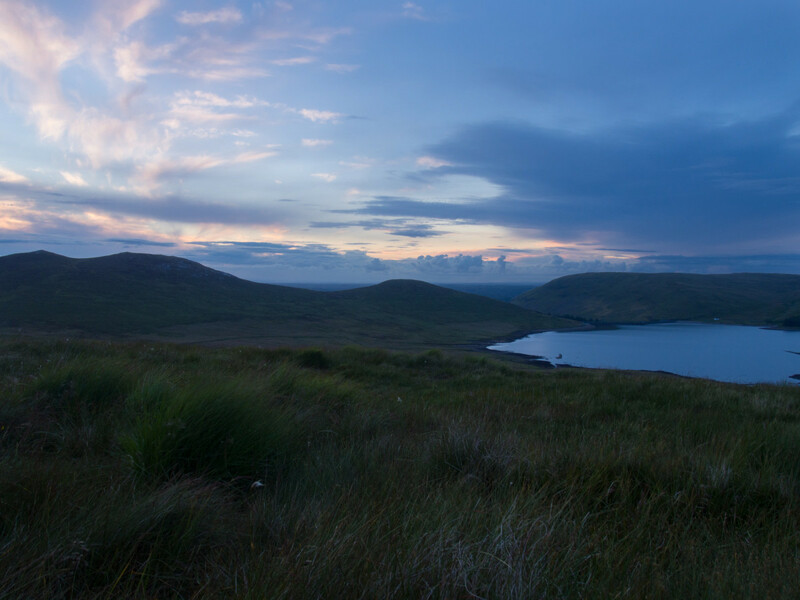 Or do you know an even better spot for first time wild camping? Let us know in the comments below! Thank you l was born and raised in N Ireland and l am revisiting one or two more times from Canada to Ireland . I hear Canada has some pretty wonderful wild places too Colin!